International Medical Relief is committed to helping the people of Panama. IMR has sent 8 teams in the last three years to Panama, working with indigenous people and small villages throughout the country. On this trip, you will be part of a continuing effort to help some of Panama’s poorest groups of indigenous people and the indigenous community that works in the largest garbage dump in Panama City. The team will also work in small villages where 8 different indigenous communities will come together to receive care. The team will travel by various modes of transportation into the Panamanian jungle for this part of the trip and you will have one night of camping in the village! All of the other nights you will be in a lovely hotel in Panama City - this trip is the perfect mix! You will have a great adventure, seeing first hand how your patients live, in the city and in the jungle, while helping hundreds of indigenous people to be healthier! The Republic of Panama is located in Central America. Panama is bordered by the Pacific Ocean, the Caribbean Sea, Costa Rica, and Columbia. The striking landscape of Panama varies from mountains to long stretches of pristine beaches. Rich in natural resources and minerals, the landscape is scattered with waterfalls. Panama is known for the Panama Canal and this must-see engineering wonder is on our list of things to do. Watching the big ships go through the canal and learning about this engineering wonder is quite fantastic - did you know that the original gigantic dredging machines are still in daily operation, more than 110 years after first starting their engines?! These indigenous people have greatly limited chances of survival if their illnesses are not diagnosed and treated. According to the World Health Organization, diarrheal diseases, cholera, and pneumonia are among those diseases devastating the people of Panama. Communicable diseases are not the threats, however. Alcoholism, poverty, and a lack of potable drinking water all contribute to the public health issues of these communities. 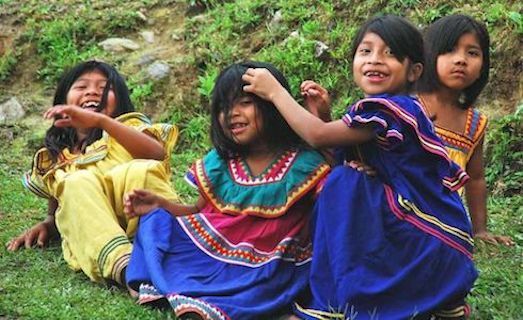 Indigenous people comprise 8% of Panama's population but 19% of the poor and 35% of the extreme poor. Hypertension and diabetes are on the rise, as they are everywhere. The IMR team will help ensure that these tribes survive and have the health care that they need – we combat these acute illnesses through a strong focus on preventative education and with your fantastic skills by providing acute medical and dental care. You can expect to see and treat many skin infections including tinea, impetigo, cutaneous leishmaniasis, and staph infections. Scabies and lice are also prevalent. You'll see ear infections, upper and lower respiratory tract infections, and many different vaginal infections. Leptospirosis and giardia are also common conditions. From an education perspective, your team will focus on clean drinking water, water storage, and sanitation. Malaria and mosquito bite prevention will also be important! Please join us as we return to Panama to care for people with very limited access to care. To help you give the best care possible, your translators will speak excellent English and Spanish. We will add additional local translators as needed for the indigenous languages. We need your help! Please join this amazing team! This trip will be a mix of staying in a great hotel and camping (or sleeping inside a building) in the village where you will provide much needed care for patients in remote communities. It will have the best of all worlds--time in the jungle, time in the city, and wonderful food! You will experience life in the small villages and may have the opportunity for some amazing birdwatching . The Harpy Eagle is Panama's national bird, but the bird to watch for is the famous Emerald-Green Quetzal! This trip will start and end in Panama City, Panama. We can't work to work with you!! A one-day tour of the Panama Canal and the Miraflores Lock Visitors Center is included with this trip. We hope to see one of the massive cruise or container ships slip through the Miraflores lock during our visit. It is remarkable to see how the ships are guided through the locks as they silently rise and fall. During your time in Panama you will see a bit of the city and a bit of the jungle. You will travel by canoe through some amazing country as you wave to the local children who will excitedly wave back with both hands! Don't forget to look for sloths!! Panama is famous for handicrafts and you will certainly have some time to shop during this medical mission. You will be able to choose from molas (bright panels of cloth with intricate patterns and stitching), beautiful plaited baskets, polares (intricate and spectacularly beautiful traditional outfits), and more! You're venturing around the globe, have you considered extending your stay a few additional days to visit some of Panama's top spots? Join IMR on an exclusive three-day extension! The Panama Canal, which cuts through the country’s center, links the Atlantic and Pacific oceans to create an essential shipping route. Modern skyscrapers, casinos and nightclubs in the capital, Panama City, contrast the colonial buildings in the Casco Viejo district and the rainforest of Natural Metropolitan Park. July 13, 2019: Get ready to see where the city meets the jungle! Flying into Panama City will amaze you today! Please plan to arrive at Tocumen International Airport in Panama City, PANAMA (not Panama City, Florida!!) by 5:00pm on July 13. If you are on the group flight or have arranged for the IMR transportation you will be picked up and taken to your hotel in the Cerro Patacon region of the city. Your first day of clinic is tomorrow! We will go over clinic protocols, patient care guidelines, safety and security, how we work together as a team, schedules, and much more. Dinner and a good night's sleep are the final items on today's agenda. July 14 - 16, 2019: Clinic days 1, 2, and 3. Today is your first day of clinic and there are a lot of patients waiting for you! You will be working in a church located in the heart of the indigenous families community who work in the garbage dump - one of the largest in the Americas. These hard-working people receive little care and have been waiting for you all year. You'll see everything in these clinics from the newborn to the very elderly with many families of all ages. Much of their hygiene revolves around bathing in the many small streams, and of course, much of their drinking water comes from the same source. You will see wounds, infections, general illness, cerumin removal, and some tropical disease as well. Hypertension, diabetes, and asthma/COPD don't miss this place - you will diagnose, educate, and provide medications as appropriate for these kind and quiet people. This is a wonderful clinic with something for everyone to help with! July 17, 2019: Clinic day 4. You'll be leaving your hotel early today for a short bus ride and a long canoe ride!! Motorized canoes followed by a short hike will take you to your clinic in the jungle!! Clinic will start around 11:00 am and continue into the early evening. Throughout the day today and tomorrow the surrounding villages will arrive and you will have the opportunity to treat patients from many different tribes. You'll be spending the night tonight - don't forget your sleeping bag, sleeping pad, and free-standing mosquito net. You can choose to sleep outside (bring a tent if you like) or inside the school house. Local cooks will prepare your meals and you will be amazed as the stars come out and the milky way shines bright. Bring your tripod for some astral photography if you are so inclined!! Meals included: Breakfast, Lunch, Dinner Lodging: Camping in the village! July 18, 2019: Clinic day 5. Today will be a 3/4 day of clinic. More villagers will arrive by canoe, flatboat, and maybe even horseback. As with your first clinics this week, these patients are waiting for you too! After saying some sad goodbyes, you will hike back to our canoes and begin the journey from the jungle to the city. But don't be sad - the Panama Canal and the Miraflores Locks await tomorrow!! Tonight and tomorrow night you will spend the night in Casco Viejo - the heart of the tourist area - as you prepare for a day at the Panama Canal and then, sadly, your departure home. July 19, 2019: Sightseeing, You will be transported to the Miraflores Locks this morning and will spend a 1/2 day watching the big ships as they lumber upwards toward their goal of the Pacific Ocean. more than 50 miles away. Take a tour of the museum, watch the film - but don't miss the ships! The afternoon will find you back in Casco Viejo with time to people watch from the balconies, shop for treasures, head for the beach, or explore the area with your new friends. Dinner is on your own tonight so that you can pick and choose as you wish - Casco has everything from nouveau haute cuisine to simple fare and lots of ice cream in between! Your team leader will host dinner if you wish to stay close to the hotel. July 20, 2019: Departures. Depending on your flight times, the day is yours! If you are on the group flight or have arranged for IMR transportation, you will arrive at the airport 3 hours ahead of your flight home to ensure a smooth check-in and give you time for a bite to eat at the airport. If you are transferring on your own, taxis and ubers are everywhere - grab and go! Don't forget to upload your great photos to your team's cluster photo site! We hope to see you back in clinic soon!! Pay 1,475 and complete your application to secure your place as a TEAM MEMBER! Before Apr 16th, 2019: YES! IMR will arrange your international flight on a "group" ticket at your request! Pay 1,475 of the total cost AND upload all of your required documents and forms to be eligible to fly on the international group ticket. YES - We need your help to take IMR supply bags internationally to Panama! Take 2 supply bags for IMR both ways to Panama. IMR Group Flight: In order to qualify for the IMR Group Flight, you will need to reach 50% of the required donation on or before Apr 16th, 2019. Early Bird Special: A discount of $200 is awarded to team members who raise / pay 50% of the required donation on or before Apr 16th, 2019.